Man, what a night we had here in the state of Indiana ! A night filled with thunderstorms, tornadoes, and flooding all taking place at the crack of dawn. Just last week temps dropped and we awoke to snow again. Last night we didn’t know whether to get a row-boat or to run and take shelter. The good news is today the sun is shining and we made it through with no damage. To wrap up last weeks lessons on E. Our egg experiment was a success. We managed to make a raw egg, rubber and was able to bounce it like a ball without breaking it. We are taking the same egg to create The Incredible Shrinking Egg . I have to say these experiments went over very well with The Little’s and I see more experiments in our future. 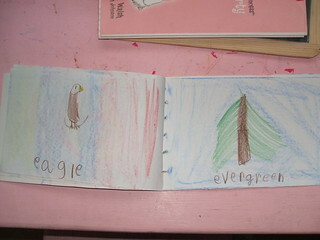 Little Sis finished her book on the letter E adding to the pages with pictures of eels, elves, eleven, and eight. 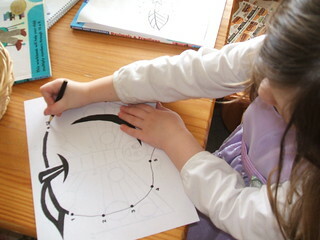 The Little’s also enjoyed the week using Ed Emberley’s drawing books. His books along with blank comic books and a set of color pencils make great gifts. 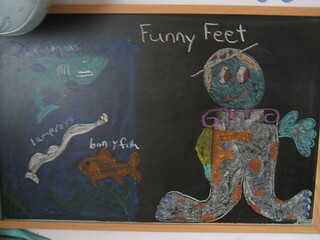 Little Sis’s lessons today was all about Mr. F and his funny feet. 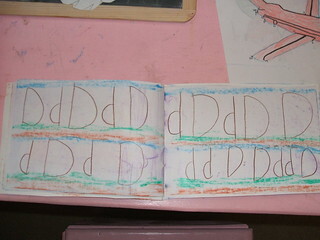 She first practiced her letter in the air then on her chalkboard and last in her book. 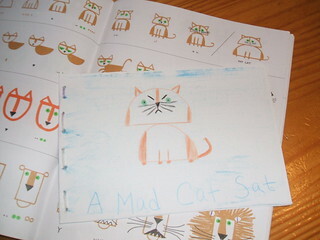 Last week she read books 1-5 of the I See Sam books. Today she read book 6. 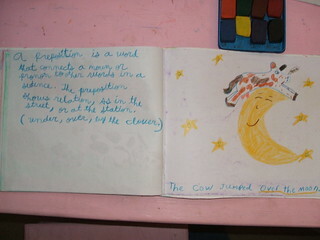 This book introduced the words Sis and Mit. She is doing really well sounding out new words. I think we will continue with this book for the next few days. I am not in any hurry to push her to read, she has plenty of time. It is important she is able to write and spell these words as well as read them. When asked to spell rat she understands how to sound it out to spell it. I see she” gets it”, she is going around trying to sound out everything. She is learning to sound out words like “me” and will try it both with a short e or long e until it makes sense. We marched them out and broke down the words finding any smaller words, (c)art) il (age). She copied them once in cursive and printed them once. Today for reading we are continuing with the book The Giant Golden Book of Elves and Fairies by Jane Werner. I hope to start The Fairy Chronicles by J. H. Sweet next. “Impossible things are happening every day” okay this song is not from the movie Mary Poppins, however, it is one that has been on my mind since watching Cinderella a few weeks ago. Have you ever had a feeling come over you that you were meant to be at a certain place at a certain time for a certain reason? Well, I did last night. Last night we packed the family up and headed to The Artcraft Theater. This is a movie theater that was built-in 1920 and the town of Franklin Indiana has managed to keep it in its original stature. You buy your ticket out front, where characters from the movie welcome you, and as you walk in you begin your journey back in time. Ahead of you as you make your way to find a seat you pass the coat check room and they still have the piano down by the screen. Before the movie starts you are treated to a small skit and other activities which include the drawing of prizes. Then before the lights begin to dim the curtain slowly opens as you stand for the National Anthem. You are treated to a short cartoon and your movie begins. Last nights showing was Mary Poppins. Yes the original, there was no 3-D in this movie. We are all very familiar with Mary Poppins, one does not have a child in a drama that does not know Julie Andrews, but it never fails with each screening I always learn something new from watching this movie. This past year has been very, well let’s just say exciting. A loss of a job, getting a job back, a trip to the emergency room, papa having surgery, finding out papa has a gluten allergy, and let’s not forget a child spreading her wings and moving all the way to the west coast. Add this with an encounter of being made to feel inadequate and you have my “excitement” in a nutshell. *(Updated)* I forgot to add exploding appliances to the list but that is a whole story of its own. So imagine my surprise when what I thought was going to be just a fun night out with the family became a learning experience for a certain mama. The message in this movie definitely is more than “a spoon full of sugar helps the medicine go down”. I left the theater last night adding two more mottoes to this years list, laughter is a MUST for survival and well I think Mary Poppins says it best. “First of all, I would like to make one thing quite clear, I never explain anything”. Wishing many blessing for the week. ! 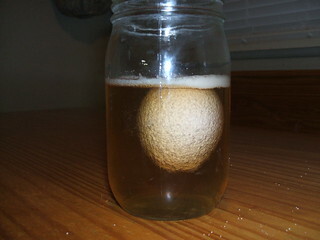 Well it has been 48 hours since our last egg experiment, I needed to change the vinegar. 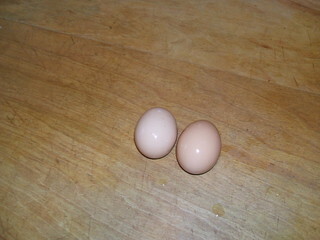 We have officially managed the naked egg. The shell is gone. 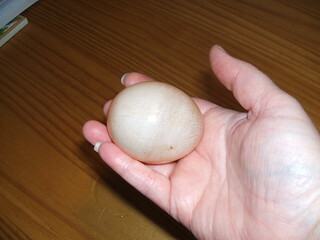 We need to keep it in vinegar until Sunday to be able to bounce the egg like a ball. 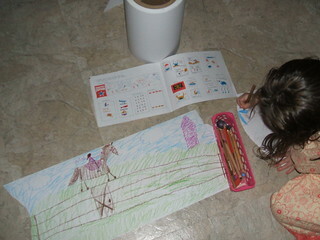 and worked on her spelling and vocabulary words. For spelling yesterday she looked at her words turned them over and tried to spell them on paper. Today she typed her words in at spelling city.com. She finished looking up this weeks vocabulary words in the dictionary. For reading Miss Sky stayed up late last night to finish the Felicity series by reading Changes For Felicity. She came in crying telling me how Felicity’s grandfather died. We talked about the story and I love how without her even knowing she gave a book report. She loved this series and we are going to look for the next one ,about Elizabeth, at the library. Besides spelling city today for computer Miss Sky started her new game Clue Finders. This was a HUGE hit. I am so glad , I really searched for just the right game for her that wouldn’t seem to much like school. For Little Sis, well she is officially reading. I knew as soon as I introduced the letter sounds she would take off. 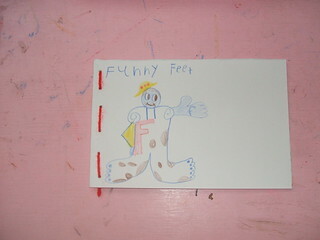 Along with the letter people we are using lessons from readinglessons.com. They have all 52 I See Sam books for free. She is SO excited, she woke up this morning with her book in hand ready to read to anyone that would listen. 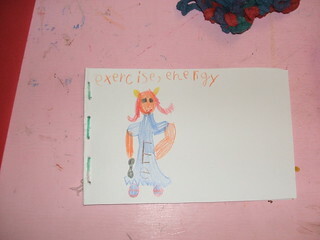 Besides the reader I made her, I also made word flash cards with all the words she has mastered. Today I made sentences using these words for Little Sis to read. I am using words from the (at), (am), (ad),(an) and (ab) families. 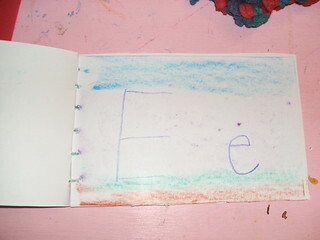 Since learning the letter E this week I will be adding words using (ed). 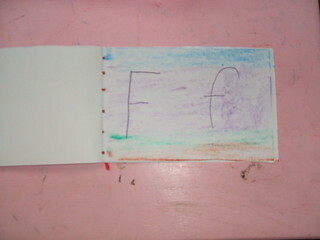 She made pictures in her E book. For her computer time she played her new game Jumpstart Kindergarten. This is a little easy for her so I am still looking for “the” game for her(I would prefer them not to play on-line). It is funny how fast they have already taken to the computer. It’s like they are born knowing. We finished our read aloud Ellen’s Lion and watched Life of Birds, meat eaters. Well I knew the sunshine and warm weather was more likely only temporary. The dreariness of the day should have triggered *warning* but no. For once I woke up feeling great and went to work fixing breakfast in the quiet of the morning while the house slept. My family members on the other hand didn’t share my cheeriness(Oh boy). They all looked at me like I personally asked for it to rain just to spoil any outdoor plans. I knew right away this was going to be one of those “one step at a time” kind of days. So I did just that. Today was reverse day. I thought if we started the day doing what we enjoy most first instead of last maybe I could get the Little’s into school mode. Well it worked (kind of, add in a bunch of sighs for sound effects). For this weeks read aloud I pulled out an old favorite. We have read “many” great stories over the years but there is one that we keep coming back to over and over (and over some more)again. Yes if snuggling up on the couch with Ellen and her Lion was all we accomplished today I wouldn’t complain. It was a good start and having new books in the book basket wasn’t bad either. Since this week is the letter E I filled the basket with our collection of Ed Emberley’s drawing books( I mean how could you say no to that). I decided to start Little Sis’s first reader. I am using words from the (at),(ad),and (ab) families. 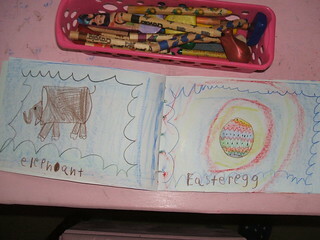 Other books in this weeks independent book basket are earthworms, eels, elephants, eggs, elk, English setter,and emu. 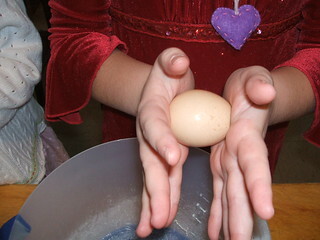 Miss Sky read Horton Hatches the Egg today for Little Sis and this led into our egg experiments. 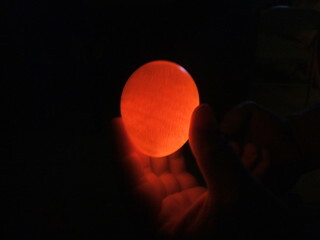 Holding the egg like pictured above, close your hands around the egg and try to crush it, you can’t. Even strong Papa couldn’t break the egg. This is why mama birds don’t crush their eggs while laying on them. 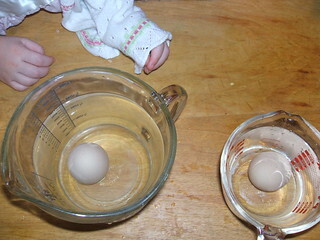 Experiment #2 How can you tell a raw egg from a hard-boiled one without cracking the shell? Experiment #3 How can you make an egg float? (The egg on the left is floating it’s hard to see in the picture)Hint one is in salt water. Last but not least we are attempting the naked egg, no it’s not a new drink, we are stripping the shell off the egg. This experiment takes 7 days but it started to bubble right away. By the time it is done we should be able to bounce a raw egg without its shell. By now everyone was in the school groove and we had circle. With the weather starting to change we have new seasonal fingerplays. 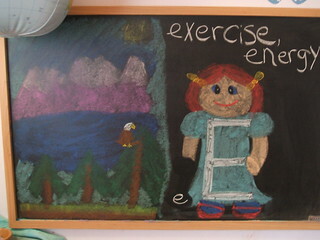 Okay into the schoolroom to learn all about Miss E.
Little Sis practiced her E’s in the air and on her chalkboard then in her book. For Miss Sky I read the story How Old King Eagle Won His White Head (found here for free) by Thornton W. Burgess and she worked on her spelling words, printing them once and once in cursive. Well at least I can say it helped pass the rainy day anyway :). This has most definitely been a full two weeks of dog love which has been just A Okay with Miss Sky. This child LOVES dogs, cats, hamsters, squirrels(we had one in our backyard named squeakers that would take peanuts out of our hands),I know you get my drift. Today in honor of finishing the book The 101 Dalmatians, after Miss Sky’s drama class, we watched the movie. We made popcorn,tortilla pizzas, using homemade tortillas,and enjoyed watching a movie together that would not involve a box of Kleenex. As far as yesterdays lessons we did manage to spend some time on our sewing projects but um well the temperatures here has been in the 60’s and we decided a day spent outside was just what we needed. (I don’t think it is normal to be outdoors without a jacket during February. )Anyhow it was more about the weather than lessons but there has been lots of relay racing (a certain Little has learned to hop on one foot rather well I might add) and crafting going on so I guess that counts right? (pictured above wikki stix). I will share some incredible links I found today. Since I use literature for the base of our lessons I am always on the look out for book recommendations. Well I found a list of books that will take you all the way through history. This site has books as well as movies to help teach history. This site has a great list of resources (with dates)as well. Alright lets see if I can get caught up for the week. Our journey starts with a reading of one of our favorite stories, Make Way For Ducklings by Robert McCloskey. It has been my goal for the Little’s to keep a nature journal of native plants (more next year for botany), rocks, animals, and such we find on our hikes to help add to our geography block. Well the idea doesn’t work unless you do it. So we are working on getting caught up because we have spotted some really neat stuff on our hikes ,like mallard ducks for one. 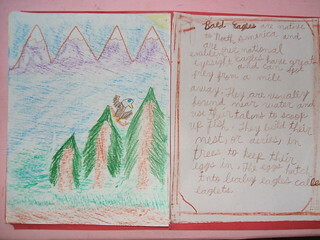 After Miss Sky read Make Way For Ducklings, I read a story about ducklings and the Little’s made a page in their nature notebooks. 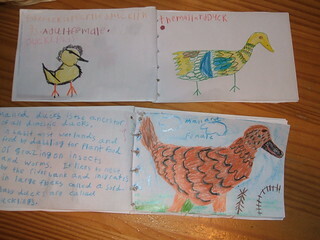 This then lead Miss Sky on an independent study to learn more about the other ducks listed from the book I read. This journey ended with mama reading The Story Of Ping by Marjorie Flack. and more code making. She has been learning more of her letter sounds by playing the quiet machine, monkey match, and ABCD watermelon on the computer at Between the lions (PBS)(Wednesday is computer day for the Little’s). She has also been playing at Starfall.com. She has added more words to her reading list from the (ad) and (at) word families and I think it is time for me to start making her readers. We finished The 101 Dalmatians by Dodie Smith and started on our sewing projects(any guesses to what they will be?) I had purchased these books to use as handwork projects during our man and animal block but thought they would fit in great with our letter study. The books are My First Doll Book by Winky Cherry (I recommend all her books). 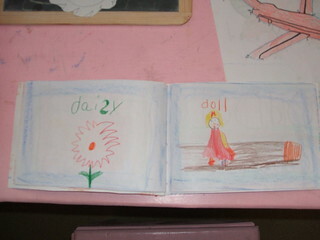 This book teaches how to make the doll hair and clothes too. The second book is Felties by Nelly Paillouz. I was really excited to see our library carries these grammar books by Brian P. Cleary and we read all about prepositions and prepositional phrases, then Miss Sky made a page in her grammar book. She also is learning what a synonym is by playing synonym Sam’s lab at between the lions. Whew, I think that just about sums it up. You could say that “a day late and a dollar short” are words that usually describe me, but I am going to post this video here for safe keeping for when moments of discouragement start to creep in. And because I loved his last talk so much. Wishing everyone a Happy Valentine’s Day !